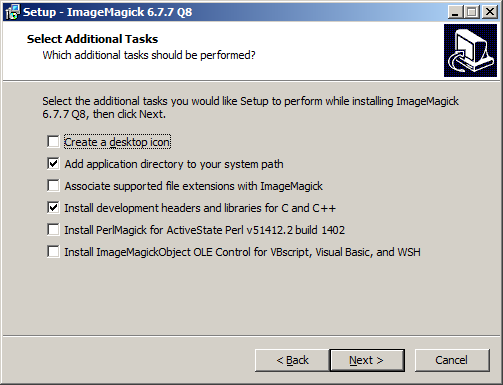 Install a compatible version of ImageMagick on your Windows machine. The version that worked for me with Ruby v1.9.3v484 and Rails v4.0.4 was ImageMagick v6.7.7.9, 32-bit (direct download here). Supposedly, ImageMagick v6.7.9.9 is the latest version that will work. [source] For different archived versions, see here. The most recent ImageMagick v6.8.x gave me errors which made me go hunting for more troubleshooting instructions. If the ImageMagick installer hangs when you try to open it from your downloads folder, try right-clicking and ‘Run as administrator‘. If you have a previous incompatible rmagick version installed, you can uninstall it using the command ‘gem uninstall rmagick‘. Check for its existence with the command ‘gem list‘. Install ImageMagick into a path with no spaces. The default ‘C:\Program Files (x86)\ImageMagick-x.x.x‘ will have spaces. I used ‘C:\ImageMagick‘ to keep it simple. Select the options ‘Add application directory to your system path‘ and ‘Install development headers and libraries for C and C++‘. Make sure that ImageMagick is first in the path, or you may encounter an “Invalid drive specification” error when extconf.rb tries to identify the ImageMagick version. [source] If you selected the ‘Add application directory to your system path‘ option from the previous tip, you should be fine. Otherwise, to double-check, go to ‘Start‘ > right click on ‘My Computer‘ > ‘Properties‘ > left hand side for ‘Advanced system properties‘ > ‘Environment variables‘ button. In the ‘System variables‘ section, look for the ‘Path‘ variable and check that ‘C:\ImageMagick‘ (or the name of your ImageMagick installation directory) is first in the list. Install the rmagick gem. If you have a compiler in your command line, just use ‘cmd.exe‘ from your Start Menu. Otherwise, use the command line available in the DevKit at the default installation path ‘C:\RailsInstaller\DevKit\msys.bat‘. Run the command ‘gem install rmagick --platform=ruby -- --with-opt-dir=c:/ImageMagick‘ and substitute the directory with your ImageMagick installation path if you named it something else. If you messed up and still left spaces in your installation path, use the command style ‘gem install rmagick -- '--with-opt-dir="[path to ImageMagick]"'‘ with the extra single quotes around the --with-opt-dir option and double-quotes around the path. Double-check that RMagick has now been successfully installed by running ‘gem list‘ and looking for the rmagick gem or ‘convert -version‘. May you have less frustration with these up-to-date (for now) instructions than I did! I tried so many ways to install it with no success. I was about to give up n and found your tutorial. Right on. I was having a very painful day until I found this help! Thank you so much!!! THis worked!!! I followed the instructions and all seems well. However, there aren’t any demo product images. I also could not upload any images. 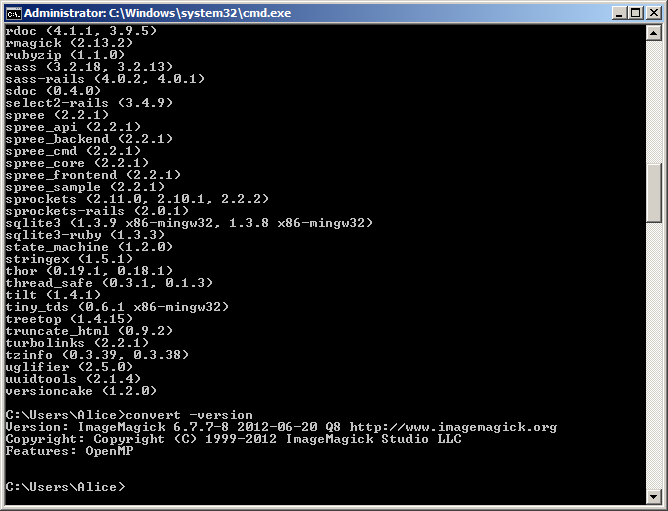 But I did the command line convert and identify and verified that ImageMagick was installed and accessible. Any idea on what might have gone wrong? How do I “cd to it”? I’m a newbie please help. ‘cd’ is the change directory command. When you open your terminal, you use the ‘cd’ command to navigate your current directory to the folder where you downloaded the file. If your file is in C:\ImageMagick, then you would use the command ‘cd C:\ImageMagick’ to navigate to the folder. Thank you very much..excellent instructions worked!! Do you know how I can solve this issue? Are you sure that you had it *first* in the path? I believe I had those error instructions covered in the tutorial. It looks like the reason why the version of ImageMagick is so important is because the regex on lines 112 and 123 inside extconf.rb of the rmagick package no longer matches the version number format of later versions. The regex is “/Version: ImageMagick (\d+\.\d+\.\d+)-\d+ /” and newer versions have a new format that has two dashes instead of one dash before the last number. 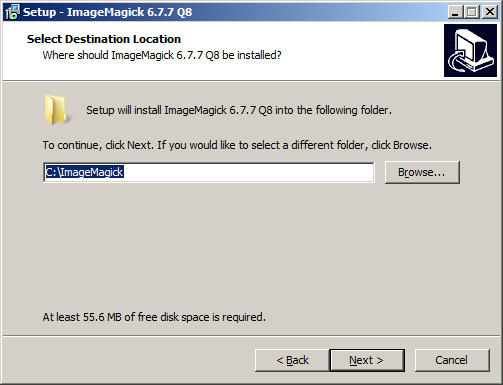 For example, “Version: ImageMagick 6.7.7-8 2012-06-20 Q8 http://www.imagemagick.org” vs. “Version: ImageMagick 6.9.1–6 Q16 x64 2015-06-20 http://www.imagemagick.org“. This actually worked! After trying and failing with a lot of other solutions, I tried this as a last resort and your instructions were perfect. I already had ImageMagick installed but it was too recent a version I guess – thankfully installing 6.7 did the trick (I didn’t actually have to remove my previous install, I just installed this in a different location). Thanks again for your helpful post. I’ve finally gotten it to work! In my course it just says “install ImageMagick” without further details. This is the only solution that worked for me. Thanks a lot. You saved my frustration. You saved my frustration. Thanks a lot !! Thanks for this. I was trying to get ImageMagick to work on my Windows 10 machine with rails and just couldn’t figure it out until I saw this. I got it to work with the latest version of ImageMagick (7.0 something) 64 bit by changing the path as you suggested. That was the main problem. If you are trying to install ImageMagick and make it work with rails on Windows, you no longer reed rmagic.